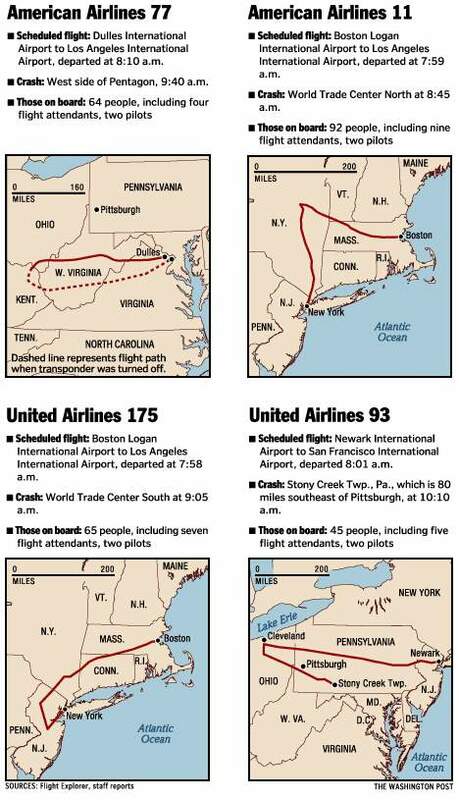 Below you will see the Washington Post's version of the flight paths of the planes supposedly used in the 911 attacks; note the departure times are listed as 7:58, 7:59, 8:01, and 8:10 AM (for flight 77). 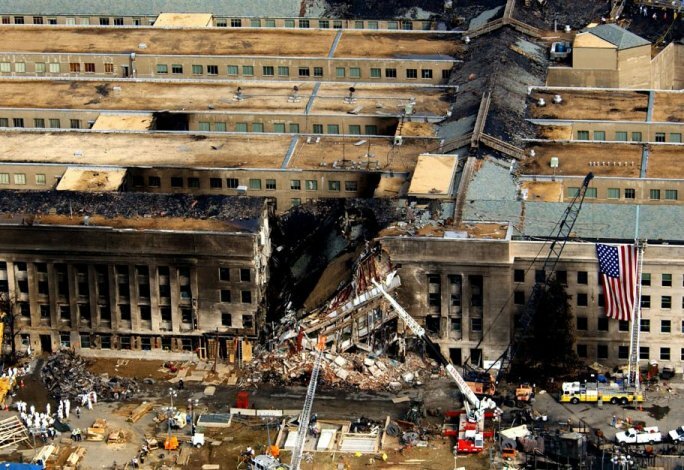 Now consider the times of the plane crashes; 8:46 for the north tower of the WTC, regardless of the fact that the plane seems to have taken a longer path than the plane which hit the south tower at 9:03, 17 minutes later; 9:37 for flight 77 at the pentagon; and 10:06 for the plane that went down in Shanksville, Pennsylvania. 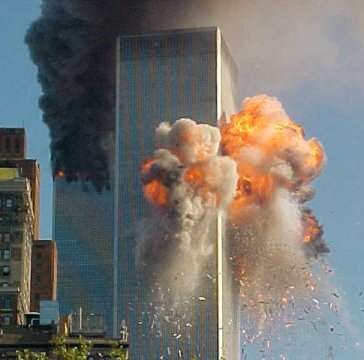 This of course means that flight 77 would have been in the air for an hour and a half, approximately 45 minutes each way, so that it would have been making a U-turn at about the same time that the towers were being struck in NYC. 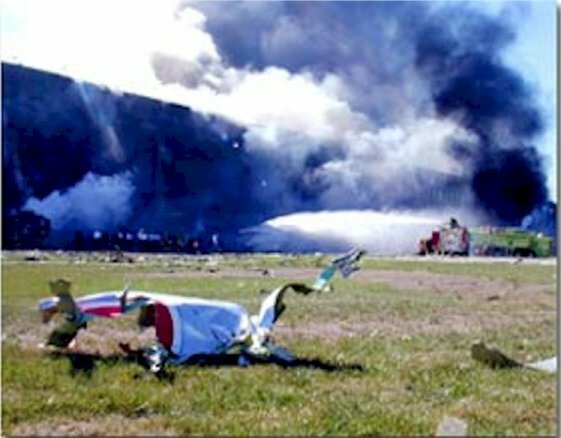 The story is that the plane made the return trip with it's transponder turned off without raising the suspicion of flight controllers or the Air Force, flying into DC air space, unchallenged, an hour after the first WTC tower was struck. 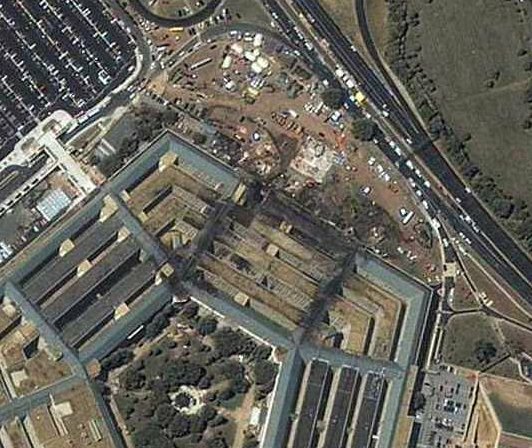 For the sake of orientation, here is an image of the pentagon with a scale model of the Boeing 757. The concrete pad with an "H" on it is a helicopter pad. 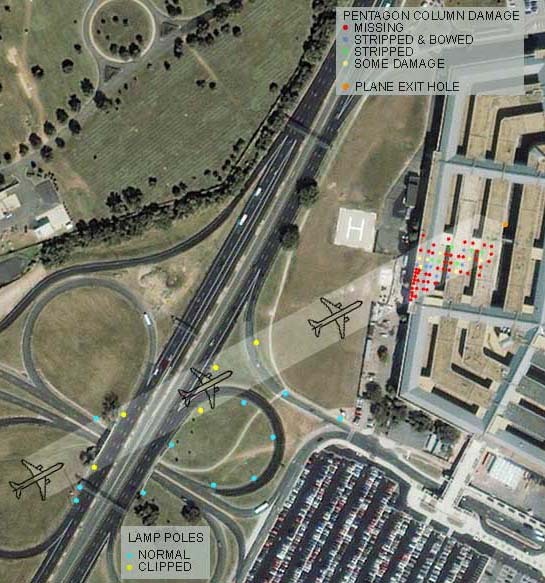 This is an image showing the apparent path of the incoming plane, which is indicated by damaged light poles. Here is an over-head view of the aftermath. Note the large black "U" shaped ring. As you can see, regardless of what the Washington Post reported in the image below; significant damage did not extend beyond the first ring. Here is a crystal clear photo of the actual damage done to the building. 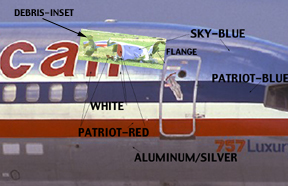 Here is an image of a 757 compared to the damage scene. It appears that the wings and tail section extend beyond the area of the damage. 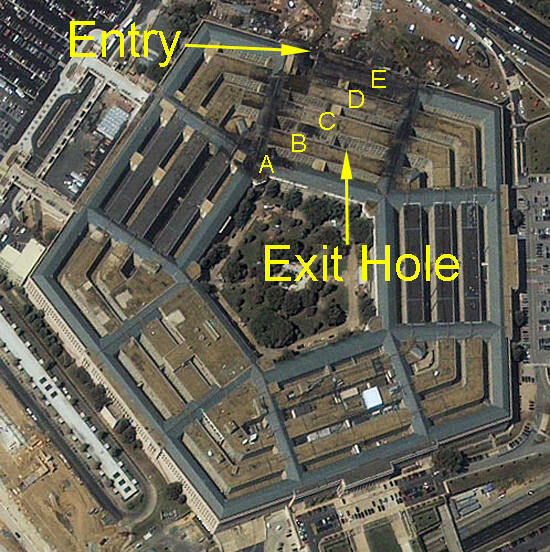 You will also see the entry and exit hole after the impact. 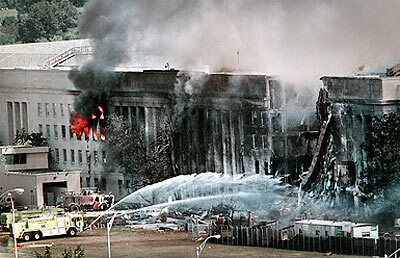 This image shows firefighters spraying foam on the building prior to the collapse of that section of the wall. 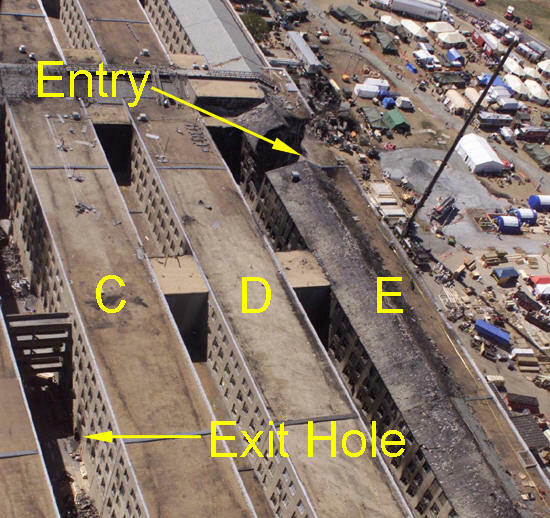 The next image highlights the whole supposedly created by a 757 slamming into the building. Here we compare images of before and after the collapse. Now look at the left side of the damage area, at what remains of the building. 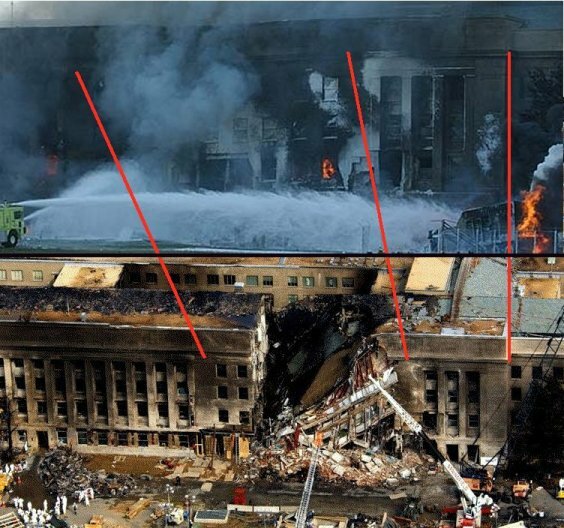 Remember that the World Trade Center towers were engulfed in fireballs, and the heat of the burning fuel was said to be enough to have melted the steel in them, causing their collapses, but that side of the Pentagon building is not even charred. As a matter of fact, you can still see a file cabinet with a computer monitor on top of it, and a wooden stool, both in perfect shape. Any fire which occurred was very well contained, indeed. Still as we saw in the images above there was a huge U shaped burned onto the roof of the building, extending far beyond the area of the apparent damage in the preceding image. Consider the extent of the areas on fire in this image. 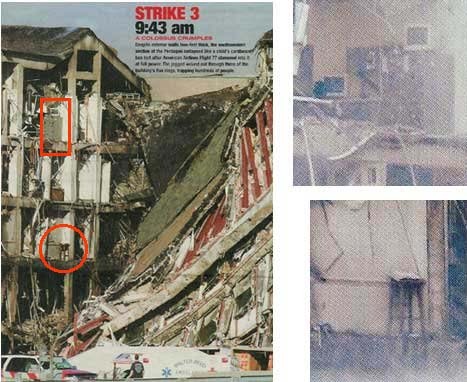 The location of the blaze in these images, taken after the collapse of the wall. 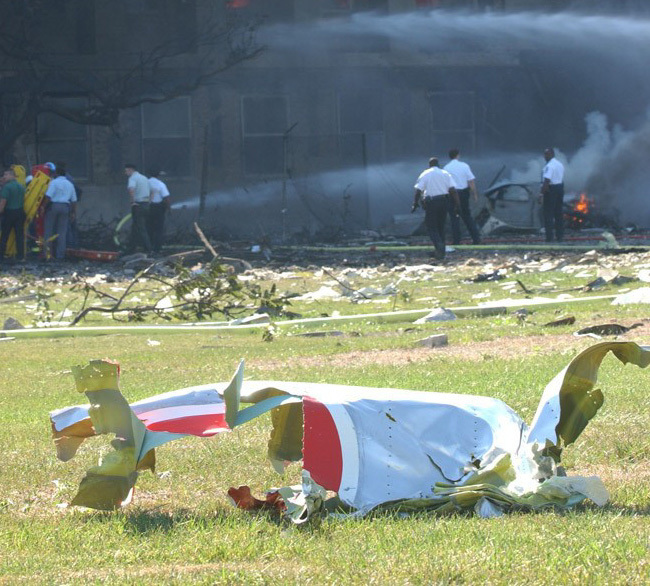 Note the absence of debris from the "plane", as well as any skid marks on the lawn. The only thing that we have been shown resembling plane debris, is this piece of what appears to be the right side of an American Airlines plane fuselage, which was found on the left side of the damaged area of the building. 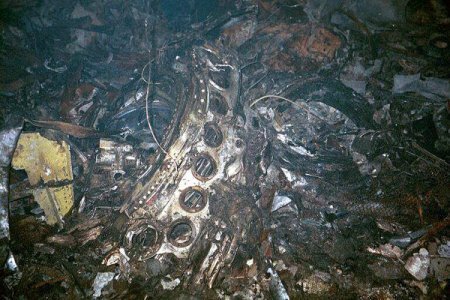 There are also a couple of pictures taken supposedly taken inside the building of engine parts, but the bulk of the body of the plane, including the fuselage and seats etc, do not appear anywhere. 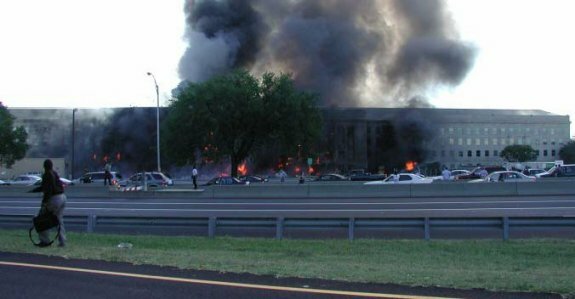 Here is an animation constructed out of still images from a camera located in the Pentagon parking lot, that show the explosion on 911, as well as what appears to be a white missile or a smaller plane. Note the white color of the initial explosion above and compare to the yellow/orange fireball at the South Tower of the WTC below. 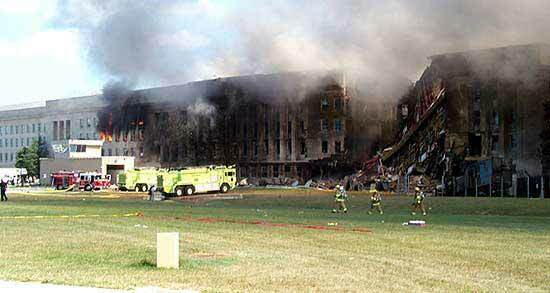 Some have suggested that the explosion at the Pentagon was something other than jet fuel. We would like to send our condolences to the 9/11 victims and families.